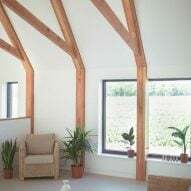 Studio Bark has embedded an off-grid home, which has a tapered roofline that opens out to a glazed gable end with views over a meadow, in Suffolk, England. 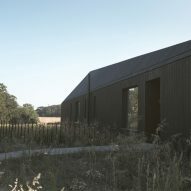 Named Black Barn, the two-storey house is characterised by its charred cedar-clad first floor, which Studio Bark designed to reference local agricultural buildings. 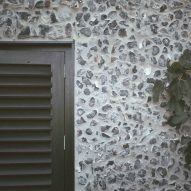 The off-grid house, which is fully powered by solar and bio-diesel, is designed to have minimal environmental impact, with the bedrooms placed in the flint-structured ground floor. 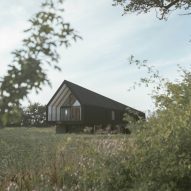 "In order to take full advantage of its setting, Black Barn was conceived as a form belonging to the wider countryside," explained the London-based architecture studio. 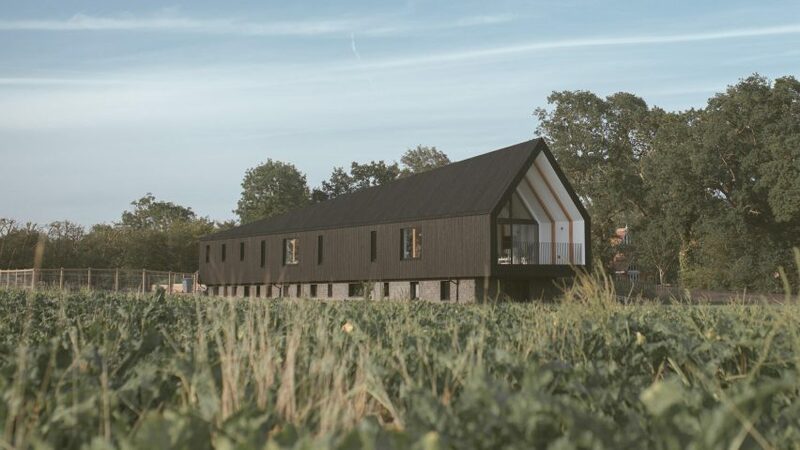 "The design is a modern yet sensitive interpretation of the black agricultural barn, a typology that has scattered the East Anglian countryside for centuries." 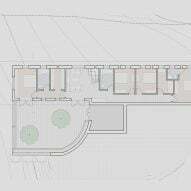 The first floor is "dramatic, bright, open and expansive", and houses a series of living spaces, including an open-plan kitchen and dining room. 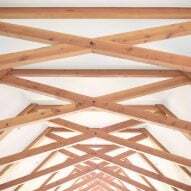 It features scissor trusses that are exposed internally, as another reference to local vernacular. 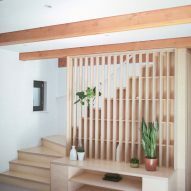 Designed in collaboration with Structure Workshop, these taper the roofline and open out the spaces to the giant gable end, which is fronted by a terrace. Contrastingly, the ground floor is designed to be "functional and calm". Accessed by a wooden staircase in the centre of the house, it has four bedrooms and three bathrooms. Studio Bark placed the bedrooms on the ground floor to shade them from direct solar gain, and help them remain cool in summer months. Both the structure and layout were developed by Studio Bark to enhance the building's environmental performance and reduce its carbon footprint. 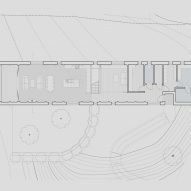 "Black Barn's striking form evolved from environmental considerations including solar heat gain, shading and passive ventilation, establishing a dialogue with the seasonal and diurnal rhythms of the site," added the studio. 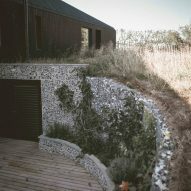 All the materials used to construct Black Barn are locally sourced, and it is completely off-grid – using energy from a solar panel, bio-diesel generator with heat recovery system and battery storage, alongside a borehole water source and packaged sewage system. The studio recently completed a building prototype that can be completely recycled, reused or composted, made almost entirely out of cork. Photography is by Lenny Codd.